Looking for RRB Chandigarh Group D Recruitment 2018-2019? Then check this article very carefully and find out the current updates regarding 7832 Grade IV Vacancies 2018-2019. Moreover, the authority of Railway Recruitment Board has announced that total 7832 Vacant Positions are available in the organization. So, all the candidates can check the Application Fee, Age Details, Age Relaxation, Steps to apply for RRB Chandigarh Group D Recruitment 2018-2019, Education Qualification, Salary info etc., from the below sections. Therefore, refer the eligibility criteria very carefully. And if you are applicable then apply the RRB Chandigarh Group D Openings 2018-2019 before 31st March 2018. The deadline is approaching soon we are suggesting the people apply as quickly as possible. The current article shows the detailed information regarding RRB Chandigarh Group D Recruitment 2018-2019 Notification. So, those who are waiting for Punjab and Haryana Government Jobs can refer and apply for the RRB Chandigarh Group D Recruitment 2018-2019. Moreover, there is tight competition for Railway Jobs. At the same time, many of the candidates had completed their application form. And few of them are searching for official Notification to get the overall details. Therefore, to help you in finding the mandatory information we have created this post. Moreover, the starting date to apply for RRB Chandigarh Group D Jobs 2018-2019 is 10th February 2018. So, interested and willing people should fill their forms before 31st March 2018. The current RRB Chandigarh Group D Recruitment 2018-2019 is an excellent opportunity for all the job hunters. 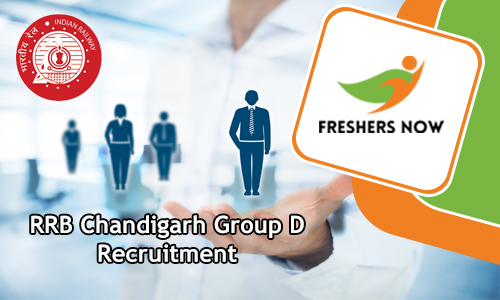 Especially a huge number of job hunters from Punjab and Haryana State are very curious about the RRB Chandigarh Group D 7832 Grade IV Vacancies 2018-2019. Our main motive is to provide accurate information for all the candidates. Moreover, coming to the application fee details, all the General category candidates should pay Rs. 500/-. And remaining candidates (SC/ ST/ Ex-Serviceman/ PWD/ Female etc) need to pay Rs. 250/- as an Application Fee. Therefore, before paying all the applicants have to check all the Payment information very clearly from the official RRB Chandigarh Group D Recruitment 2018-2019 Notification. Hence, download the Official Advertisement from the below section which is available at free of cost. Without knowing the complete RRB Chandigarh Group D Recruitment 2018-2019 information, it is impossible to apply. Every year the Railway Recruitment Board is releasing various vacancies. Many of the candidates are applying through Online Mode for the available openings. Likewise, this year also the organization of RRB came up with good news related to RRB Chandigarh Group D Recruitment 2018-2019. Therefore, all the candidates those who are interested in Railway Jobs should keep in mind that the last date to apply for RRB Chandigarh Group D Openings 2018-2019 is 31st March 2018. And now all of them are looking for Education Qualification details. So, those who had completed their 10th Class or ITI from any recognized board or university in India are eligible to apply for RRB Chandigarh Group D Jobs 2018-2019. Therefore, to get the selection process, age details and salary details just follow the below sections. The Railway Recruitment Board is planning to select all the applicants by conducting Written Exam, Physical Efficiency Test, Document Verification and Personal Interview. Therefore, those who had done their application process need to concentrate on the Written Test. Because the written exam is the first round of selection process. And next, you have to face remaining rounds. Moreover, you can also get the complete material on our website at free of cost. So, those who are going to attend the written test in April or May 2018 need to start their preparation from now onwards. We all know that the competition level is increasing day by day. To clear, this competition you have to start your preparation immediately. So, in the official RRB Chandigarh Group D Recruitment 2018-2019 Notification, the authority mentioned that all the selected people could receive Rs. 18,000 per month. We know that you people are very curious to check the Education Qualification. A vast number of people had done their 10th class or ITI or its equivalent from NCVT or SCVT in India. So, all those people are eligible to apply for RRB Chandigarh Group D Recruitment 2018-2019. To get furthermore information just click on the official Advertisement link which we have given in the below. All the General candidates need to pay Rs. 500/- as an application fee details. Follow the below-given selection rounds and start your preparation. So, to get the Age Details and Age Relaxation Details all the contenders can take an in-deep look at this section. Moreover, the Age relaxation is also applicable for all the candidates. Many of the people are unable to find the steps to apply for RRB Chandigarh Group D Recruitment 2018-2019. Therefore, to help the people in this section, we have arranged in a detailed manner. Therefore, all the candidates are informed to check the above sections carefully and apply for RRB Chandigarh Group D Recruitment 2018-2019. Hence, follow our website Freshers Now regularly.